Pauline Collins, OBE (born 3 September 1940) is an English actress of the stage, television, and film. 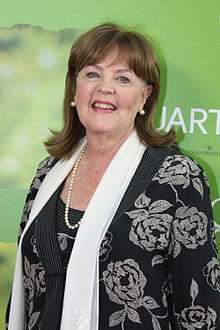 She first came to prominence portraying Sarah Moffat in Upstairs, Downstairs and its spin-off Thomas & Sarah during the 1970s. She later drew acclaim for playing the title role in the play Shirley Valentine for which she received Laurence Olivier, Tony, and Drama Desk awards. She reprised the role in a 1989 film adaptation, winning a BAFTA and garnering Golden Globe and Academy Award nominations. In 1992, she released her autobiography, titled Letter to Louise. Collins was born in Exmouth, Devon, the daughter of Mary Honora (née Callanan), a schoolteacher, and William Henry Collins, a school headmaster. She is of Irish extraction, and was brought up as a Roman Catholic near Liverpool.Her great-uncle was Irish poet Jeremiah Joseph Callanan. Collins was appointed OBE in 2001. Collins married actor John Alderton in 1969 and lives in Hampstead, London, with her husband and their three children, Nicholas, Kate and Richard. She also has an older daughter with actor Tony Rohr, Louise, whom she gave up for adoption. They were reunited when Louise was 22 years old. ↑ Pauline, Collins. (28 March 1999). "Pauline Collins - My secret for a good marriage? Give", Interviewed by Sharon Feinstein, Sunday Mirror. Retrieved on 13 May 2010. "But I was very worried about taking it on because I'm not Jewish. I'm a Liverpool Irish Catholic and this role was such a responsibility because it involved a huge and emotive part of the history of the Jewish race." ↑ "Tony Award winners in 1989". Retrieved 5 June 2016.